But the main reason I have been eager to get to Crested Butte is because I want to do reconnaissance in another ski town…Aspen! 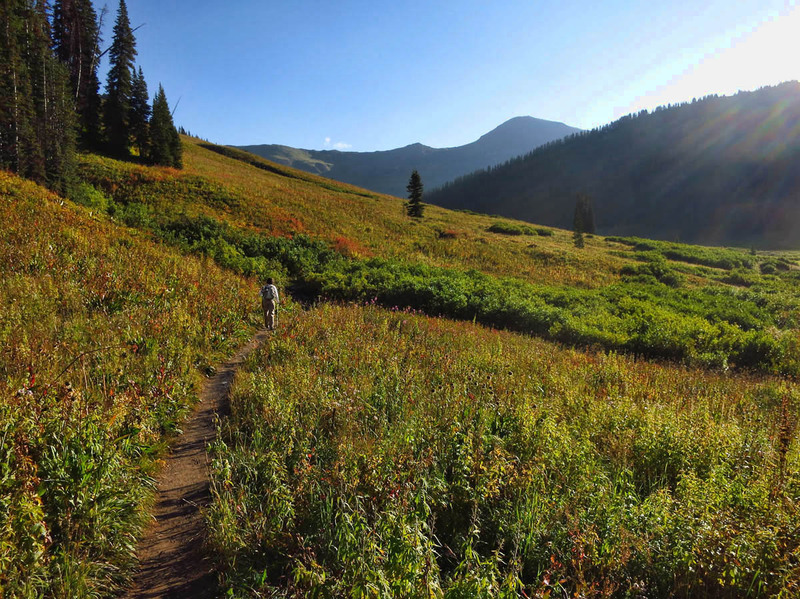 That’s right, explore Aspen from Crested Butte. 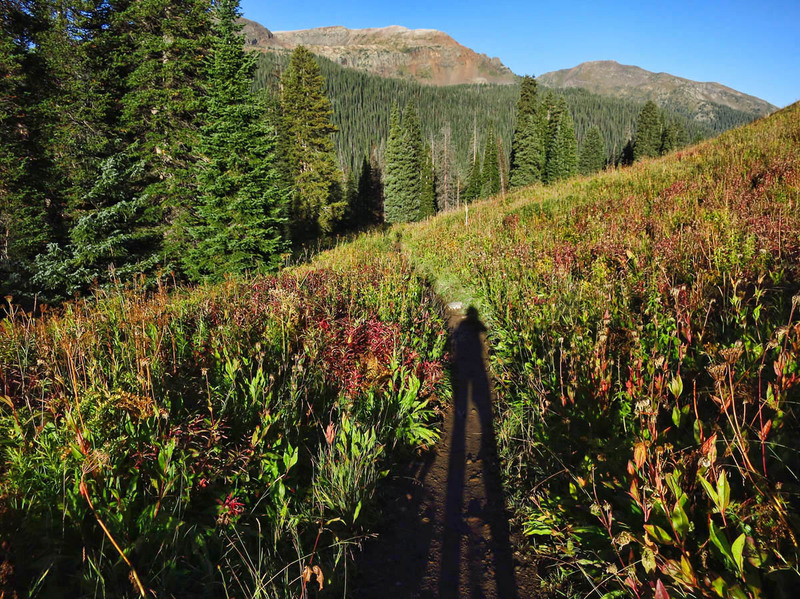 I have read there is a trail where you can hike “village to village” in eleven miles. This just sounds so cool to me, especially when what can be done on foot in 11 miles takes over 100 miles to do by car! I love talking to Mark and Bobbie and hearing about the crazy adventures they’ve had living in Colorado. Whenever I ask, “Have you guys done that?” the answer always comes back in the form of a great tale of adventure or exploration. So when I read that it was possible to do this hike leaving Crested Butte on foot and arriving in Aspen later that afternoon, I once again asked “Have you guys done that?” Well, the record still holds, as Bobbie did it eight years ago with a group of “gal pals.” After hearing her tell about it, I have to do this hike! Bobbie has agreed to join me, and since Mark is still gearing back up after surgery, we will instead have our own personal Sherpa. 😉 This is great news, because now I don’t have to saw the end of my toothbrush handle off to save a few ounces of weight in my overnight pack. I can do my usual over-packing job, and it will be there in my hotel in Aspen waiting for me. 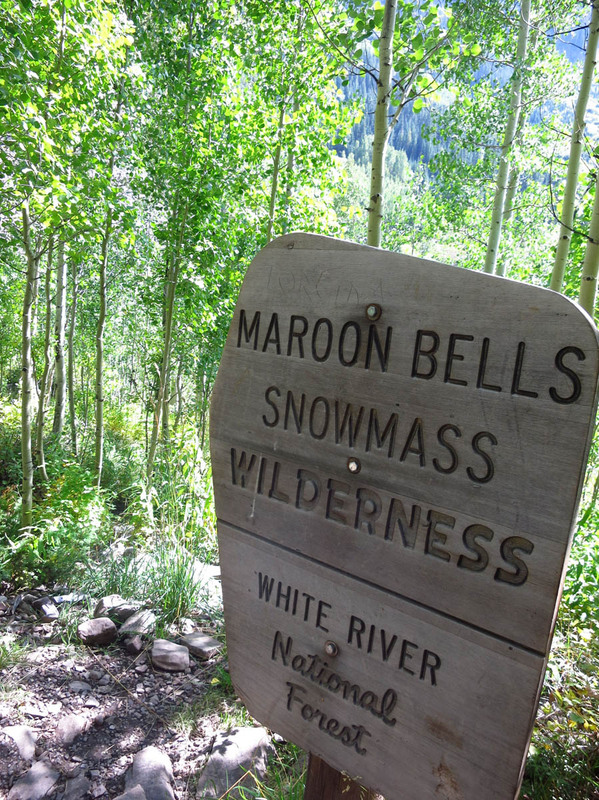 Now, if I can only complete the eleven miles over Maroon Pass to get there! Mark and Bobbie are coming from Gunnison, and I am 7 miles north on Washington Gulch Rd, so we agree to meet at the Visitor’s Center parking lot at 6:30am. This means a 5:15am wake up call for me, which is not my finest hour. There is a lot of pressure to be on time. If I am late, Mark will write an entire sonnet about my tardiness. The indoor/outdoor thermometer on my wall reads 37 degrees outside, 43 degrees inside. It’s a good thing they are already on their way, otherwise I would be tempted to stay in bed until it warms up, which at the rate we are going, might be next July! 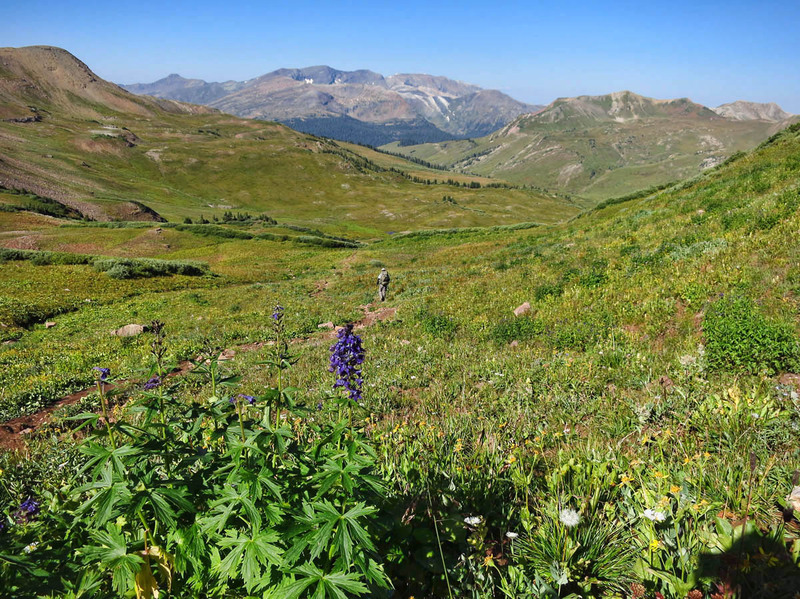 Schoefield Pass — At Last! A rest stop disguised as a photo op. It’s way too early in the morning for that, Vanna! I am elated to see (feel!) the sun! There are a few more wildflowers remaining at elevation than I expected. 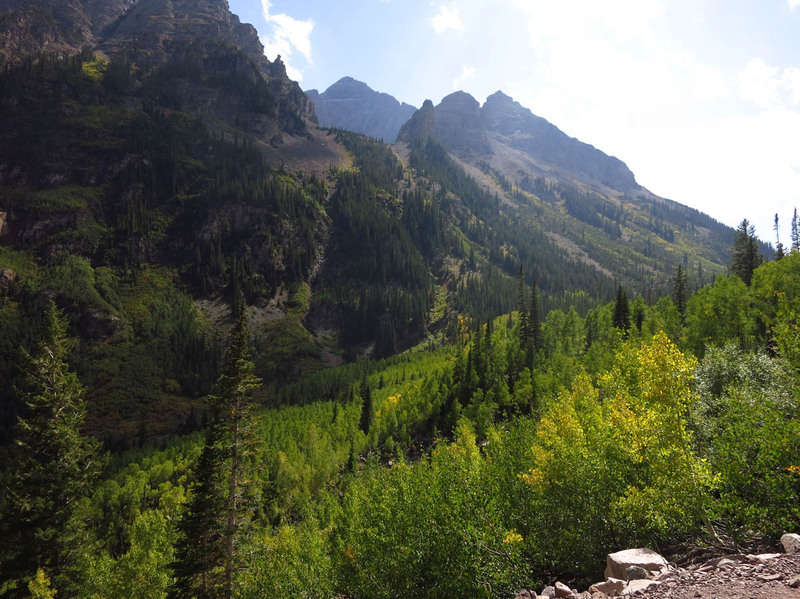 It’s a long, cold, freakishly scary drive up Gothic Road to Schoefield Pass. I ask Bobbie if she’s okay. “Yeah, the drop-offs are all on your side!” Thanks, Bobbie! 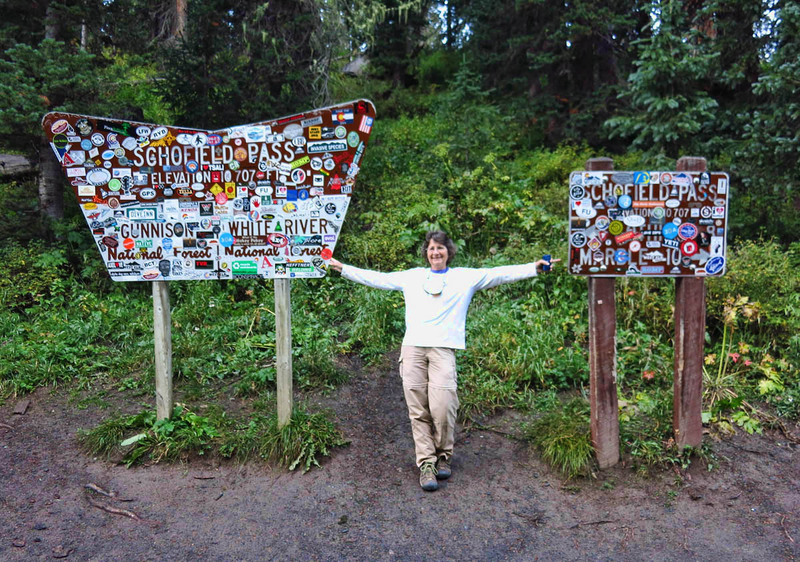 I feel such relief to see the signs indicating that we have reached the 10,705 ft pass, and the little Tracker has pulled through again! 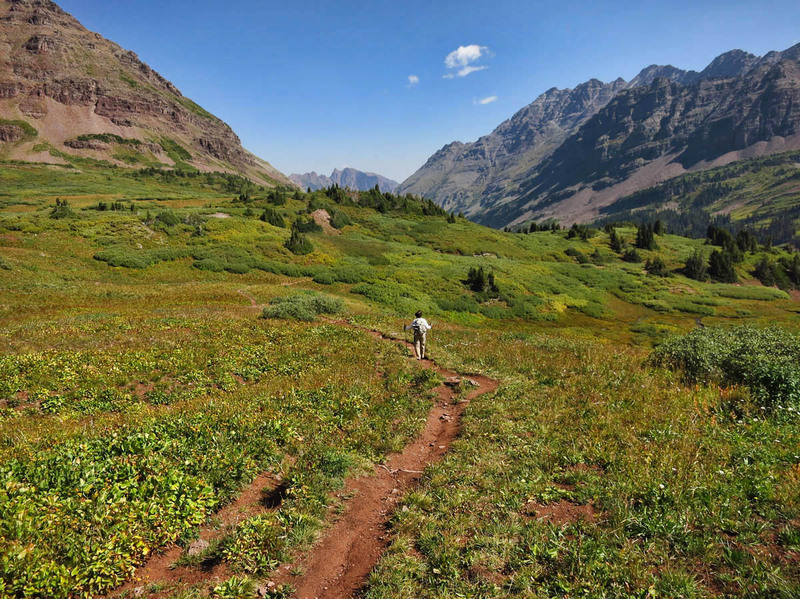 One of the many “Four Pass Loop” backpackers heads down the trail. 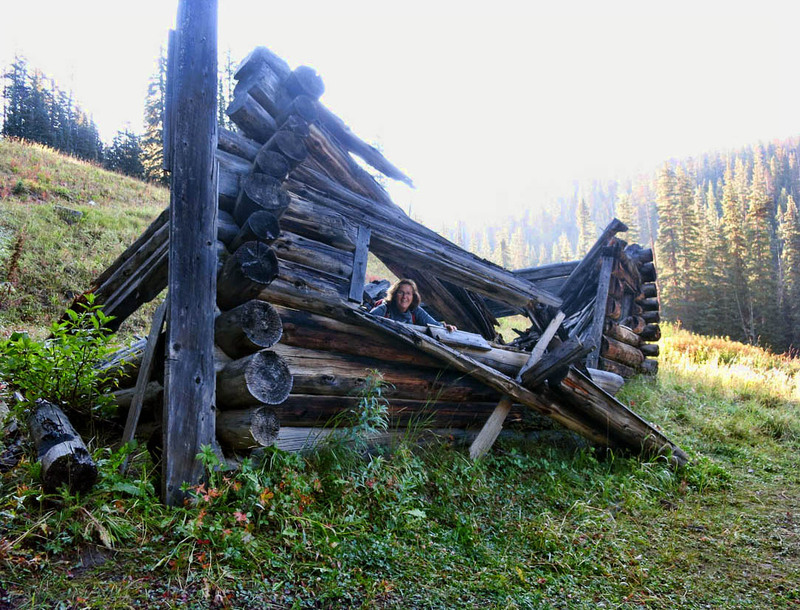 Bobbie waits patiently at the top of Maroon Pass, elev 12,500 ft.
It’s a brisk fall morning when we start off walking along a stream, and in the dark forest I can see my breath. 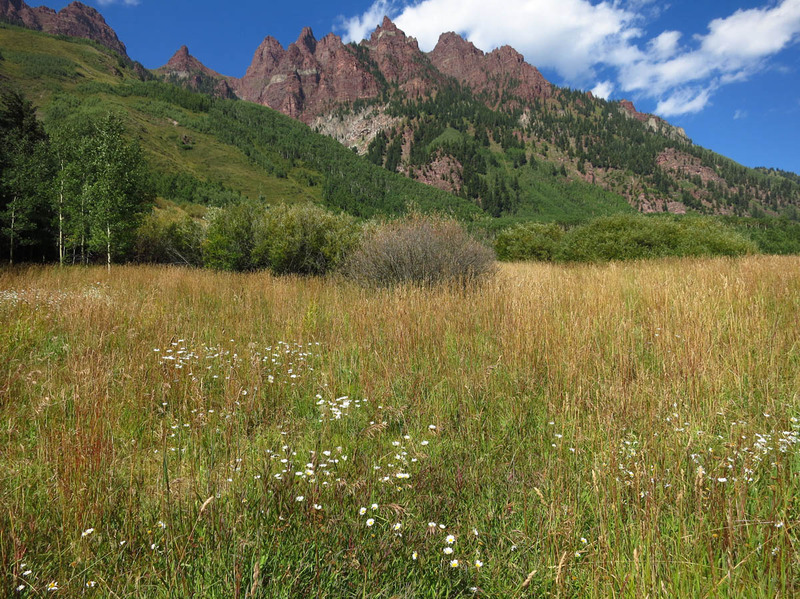 As we emerge into the basin, there are fields of “dead heads” as high as my armpits in the meadow, so I can only imagine what it must have looked like during wildflower season. 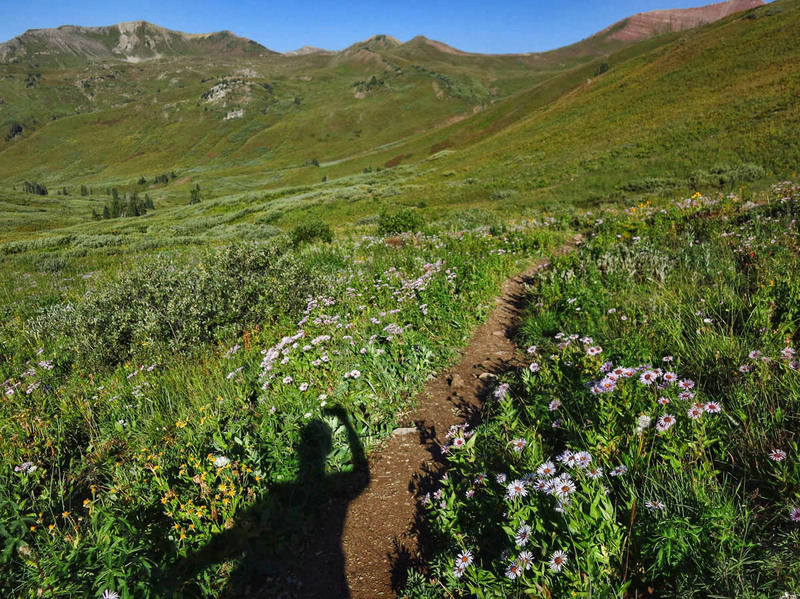 But if the flowers were in bloom, I suspect Bobbie and I wouldn’t have the trail all to ourselves. The first three miles are relatively easy. Just a pleasant, reflective walk as the sun starts to warm us. But all too soon, the climbing begins. 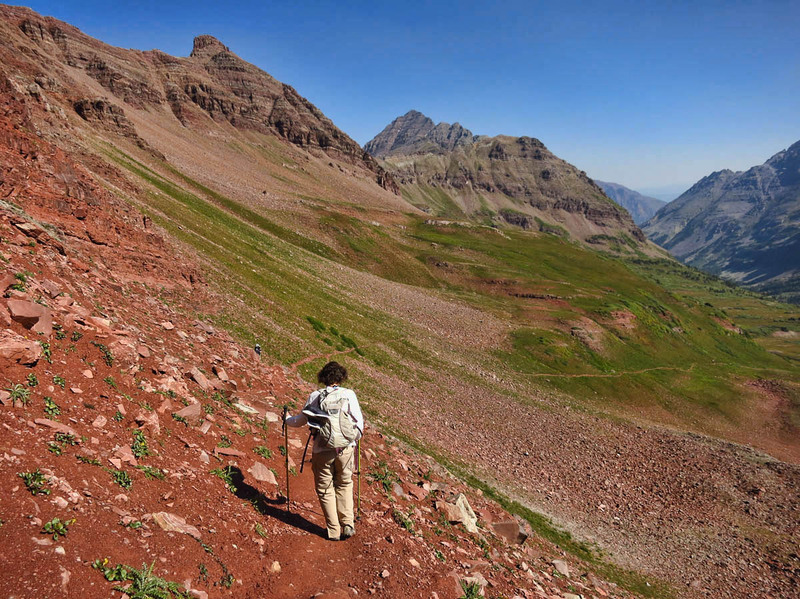 The fourth mile is a series of steep switchbacks on the way up Maroon Pass. I slow down considerably and lose sight of Bobbie altogether, but I hear her shout back, “Look! There are people up on the pass” “Oh, you mean those fly specks on the horizon?” Bobbie beats me to the pass by 15 minutes, and waits patiently as I huff and puff up the last remaining stretch of scree. I meet a few backpackers on their way down from the pass. 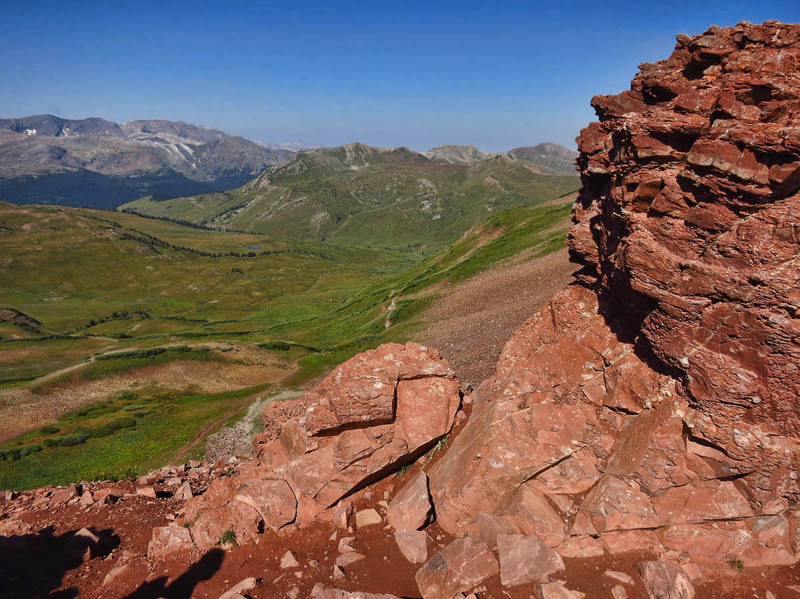 They are all hiking the 26-mile Four Pass Loop, a multi-day trip that climbs four 12,000 ft passes; West Maroon at 12,500 ft, Frigid Air at 12,415 ft, Trail Rider at 12,420 ft, Buckskin at 12,500 ft. I am just happy to have climbed one! Backpacking campground has seen recent bear activity. The views on the downside of the pass are just stunning. And for the first couple of miles, the trail is quite pleasant. But then, we start to see the effects of all the rain. The trail becomes quite muddy, to the point that it feels like running an obstacle course to stay out of it. 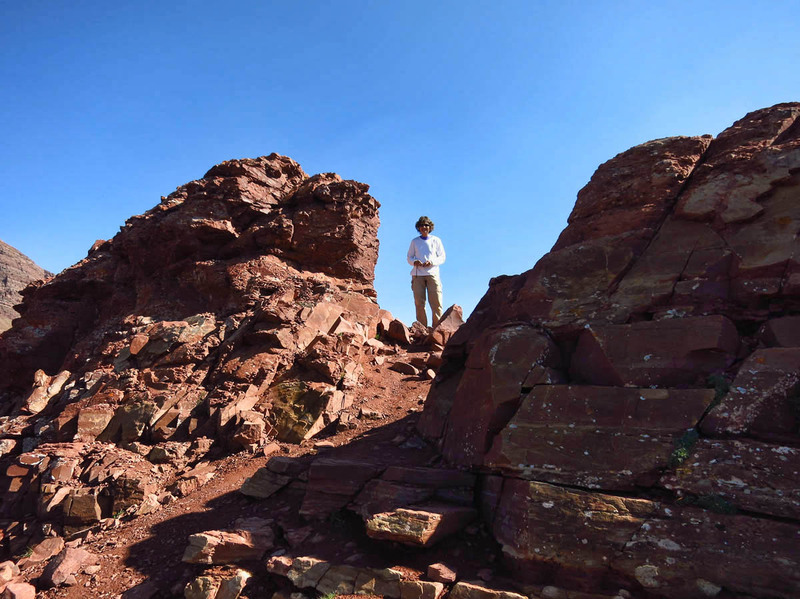 Soon, the mud is the least of my worries, as we are traversing huge fields of car battery-sized rocks. It’s a slow seven miles. 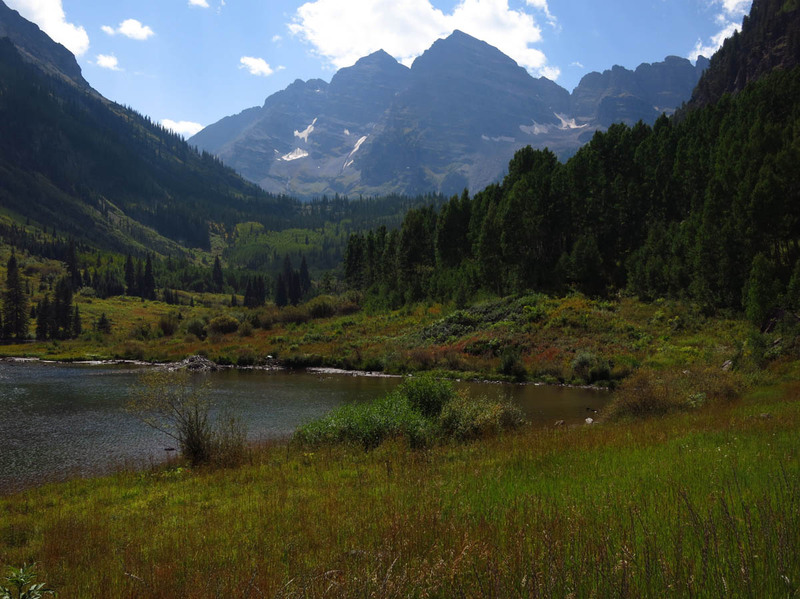 We get our first look at Maroon Bells, two twin 14ers. Bobbie tells me I will know when we are getting near, as the trail will become quite crowded, and we will start to see people hiking that don’t look like hikers. Soon, backpacks have been replaced by baby carriers, and we begin to run into the groups of ethic sightseers as we approach Crater Lake. 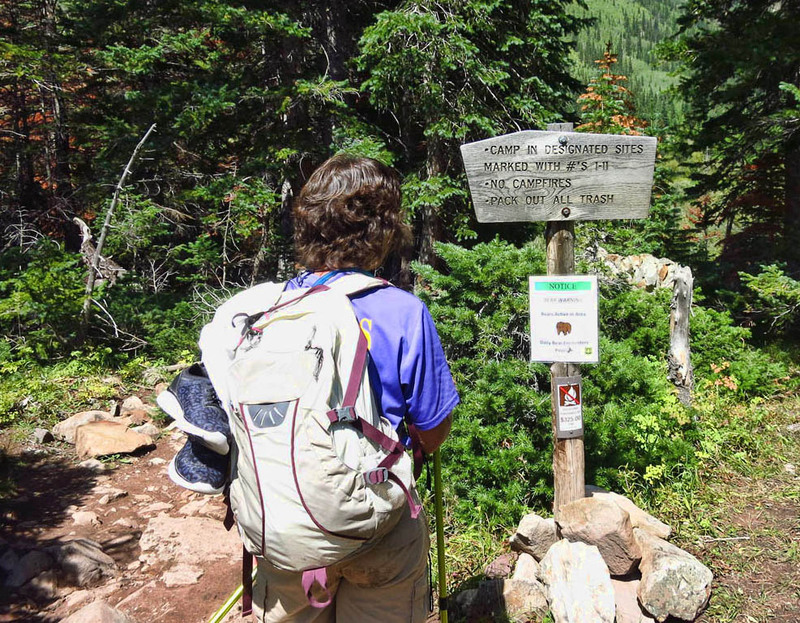 Many people hike the 2 mile trail between Crater Lake and Maroon Lake. 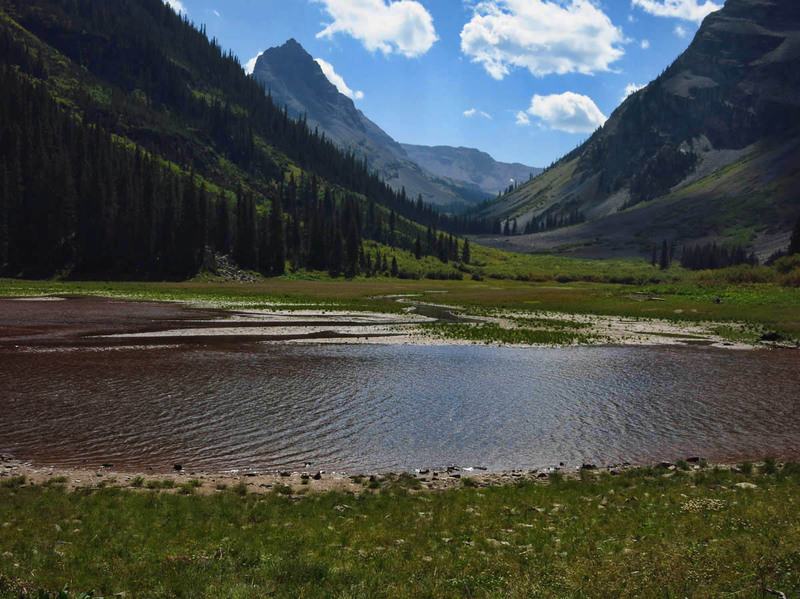 The trail ends at Maroon Lake, but no vehicles are allowed inside the recreation area between the hours of 9:00am to 5:00pm. So we will need to take a shuttle into town, where Mark is waiting patiently while consuming all the complimentary cookies in our hotel lobby. We arrive at the bus stop at 2:30pm. I am feeling good, not tired at all. We miss the 2:30pm shuttle to Aspen Highlands by five minutes. They only run every half hour. Then we miss the Apsen downtown shuttle by three minutes. They only run every 20 minutes. So it is 4:00pm by the time we reach our hotel. Waiting or riding in a too-warm, crowded bus in the sun on a winding road for 90 minutes proves to be the most tiring part of the entire hike! 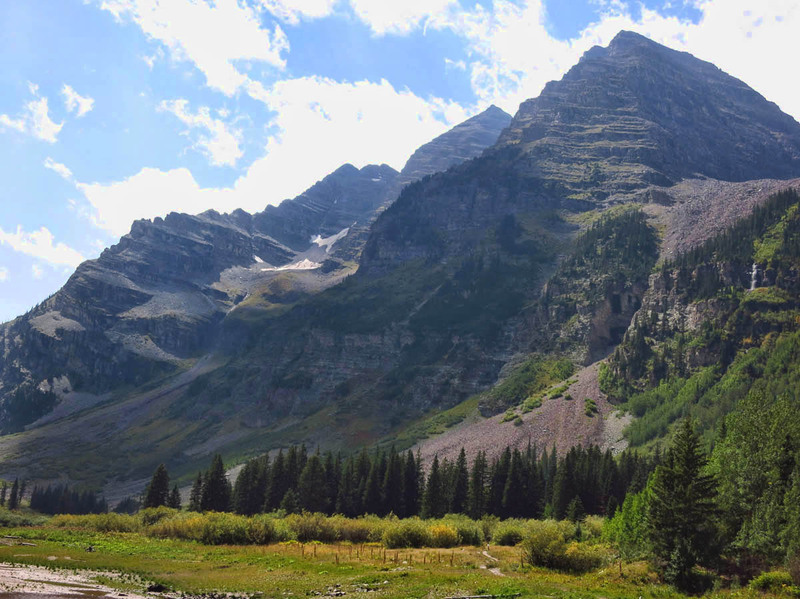 This entry was posted in Colorado and tagged Aspen, Crested Butte, Maroon Bells, Maroon Pass, West Maroon Trail by Suzanne. Bookmark the permalink. How cool that you and Bobbie were able to hike this together! Knew your mighty Tracker would make it up to the trail head! Mindy, the Tracker thanks you for the vote of confidence! He’s a little older than the cute little red one we saw on Bear Creek, but he has a lot of “heart.” haha!! Pam — Hard not to make good time with Bobbie in the lead. haha!! She’s like the Energizer Bunny! I suspect the same is true for you! Onward Suzanne. Empty that Bucket List!!! BC Mark — I can’t empty it, because you and Bobbie keep giving me more things to put in it. 😉 Thanks again for helping make it such a fun trip. 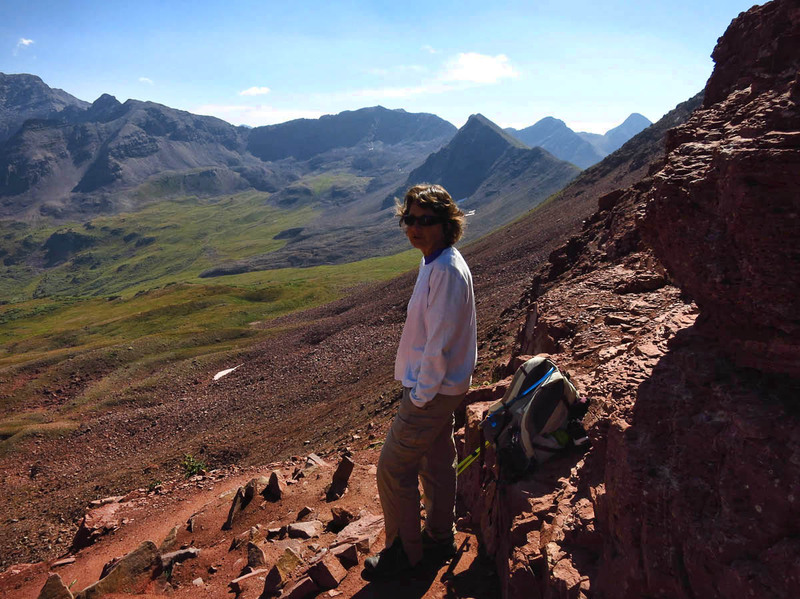 What a great post – I’d love to do that hike! 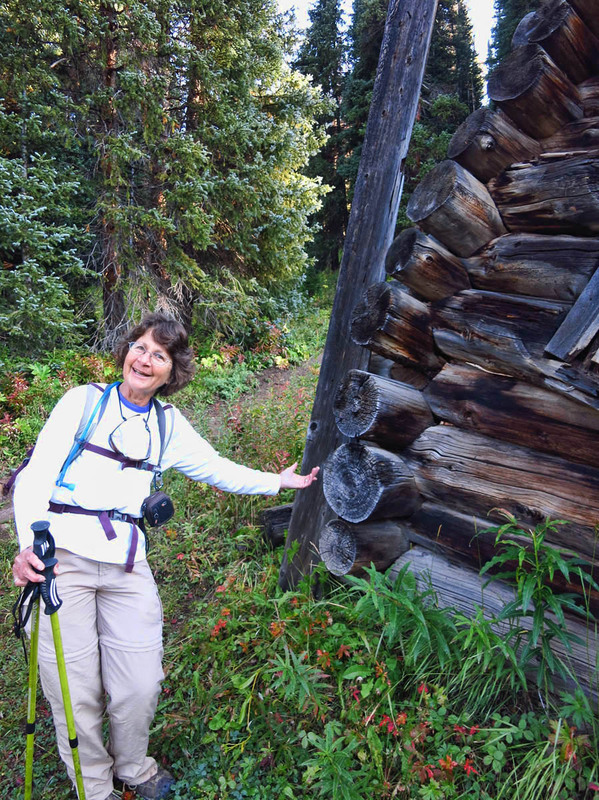 Must say, Suzanne, methinks you are getting pretty darn skinny with all this hiking! 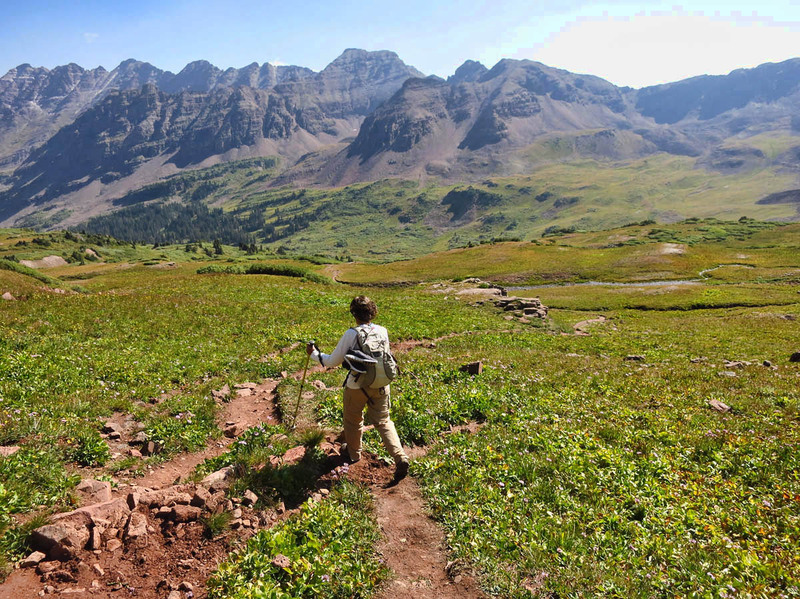 I so much love seeing all these high, open trails, with views to forever and the peaks. Much different then hiking in Oregon where we search for views through the huge trees. 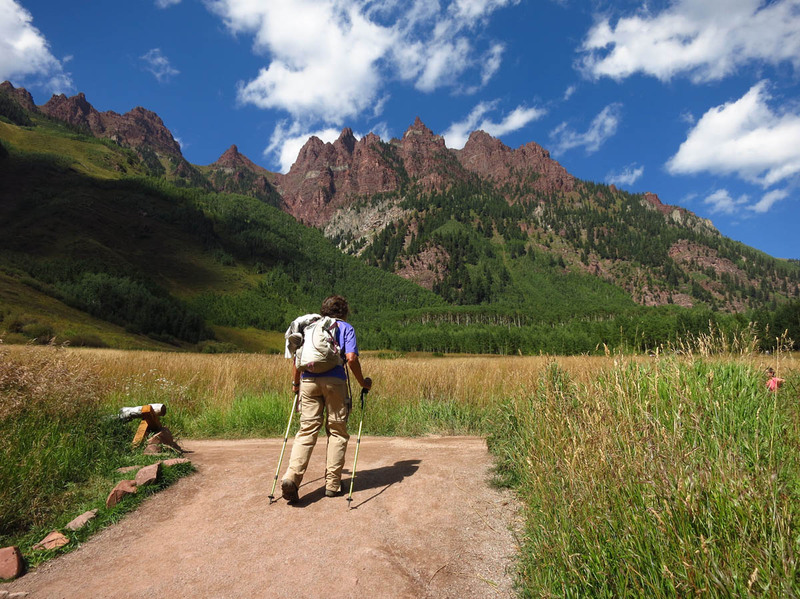 I do so hope I can get to Colorado to hike while I can still do it. Sue — Thanks for your very kind compliment, but I am a long way from “skinny!” I do have to say, however, I feel better than I have felt in 10 years. I so hope you get to Colorado to hike too, and I hope I am there to share a hike or two with you when you get there! 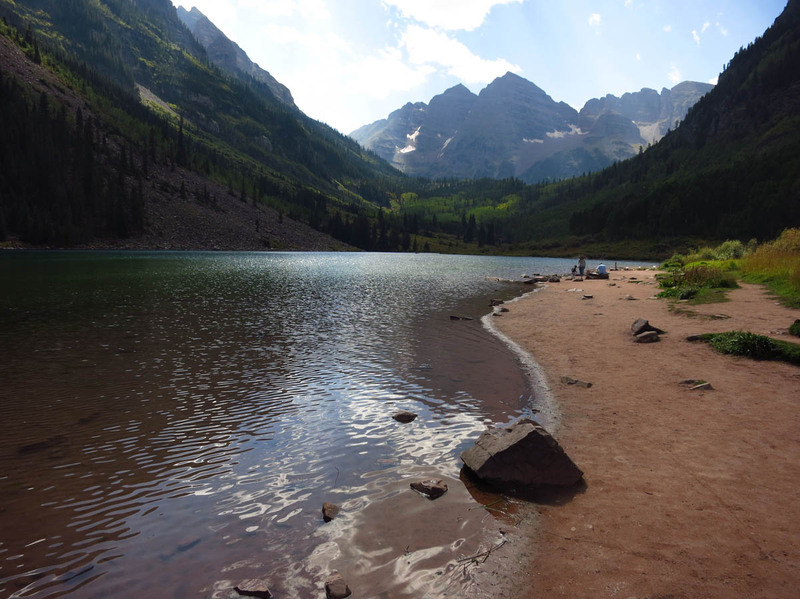 Thanks for taking us on the hike to the Maroon Bells. 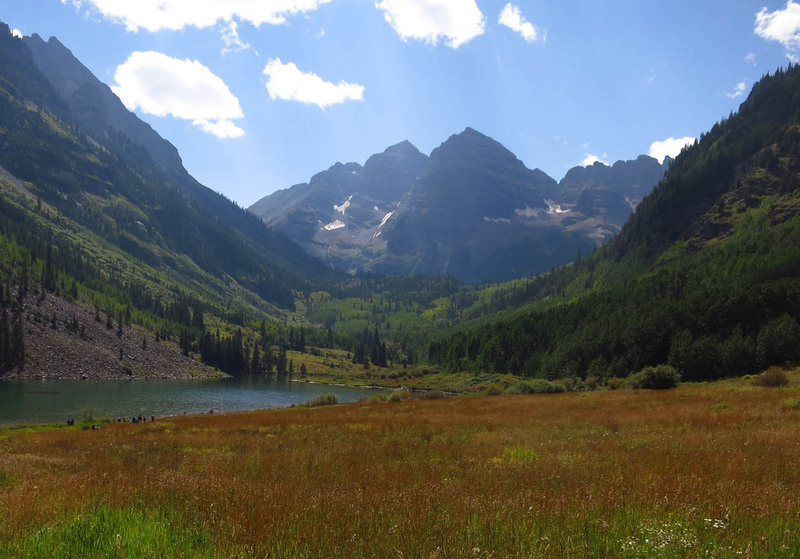 I camped at the Maroon Bells back in 2011 and there was a real problem with porcupines getting into car engines and eating the wiring. The camp host offered me chicken wire to put around my car and trailer to keep the porcupines out. I thought he was joking until that night a porcupine chew off my refrigerator drainage hose from the trailer. The next night I fenced the car and trailer in chicken wire. 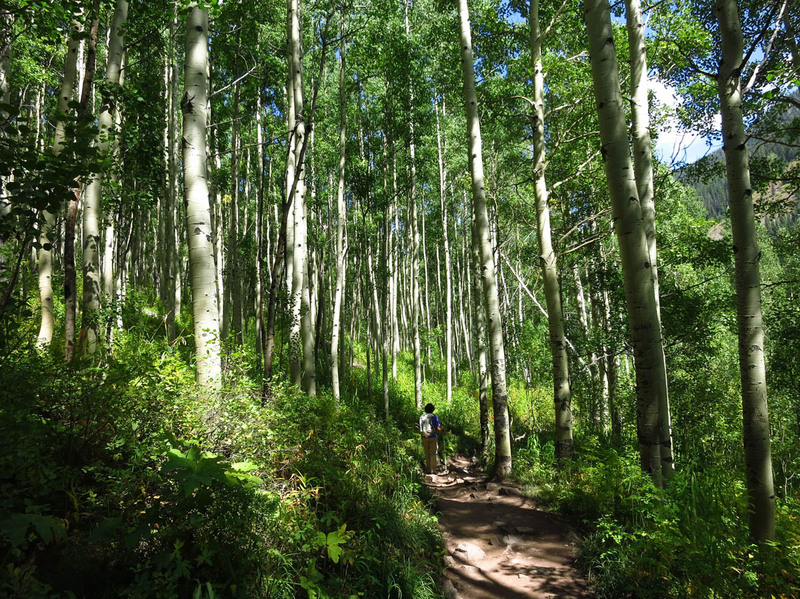 Many great hiking trails in the Aspen area and delicious dinning in town afterwards. What a gorgeous hike! 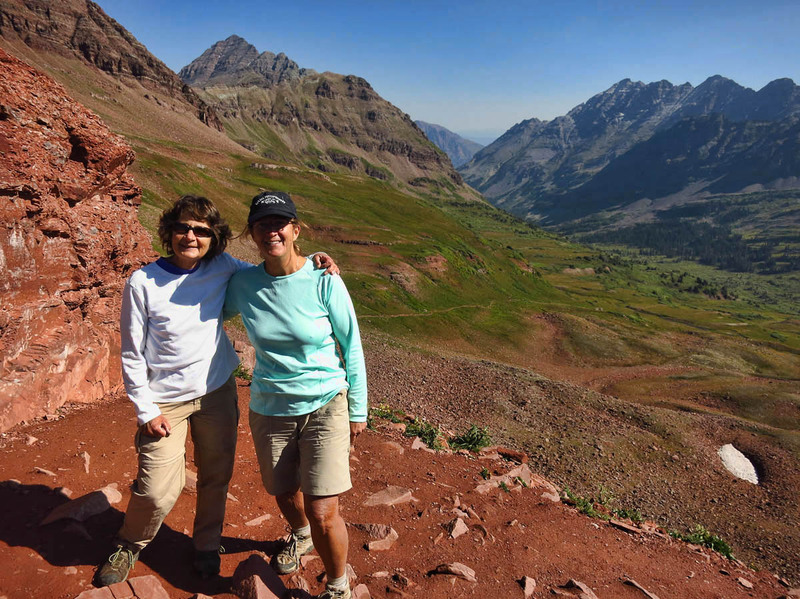 Bobbie is one of the most prolific hikers I have ever met…the perfect companion! wow! 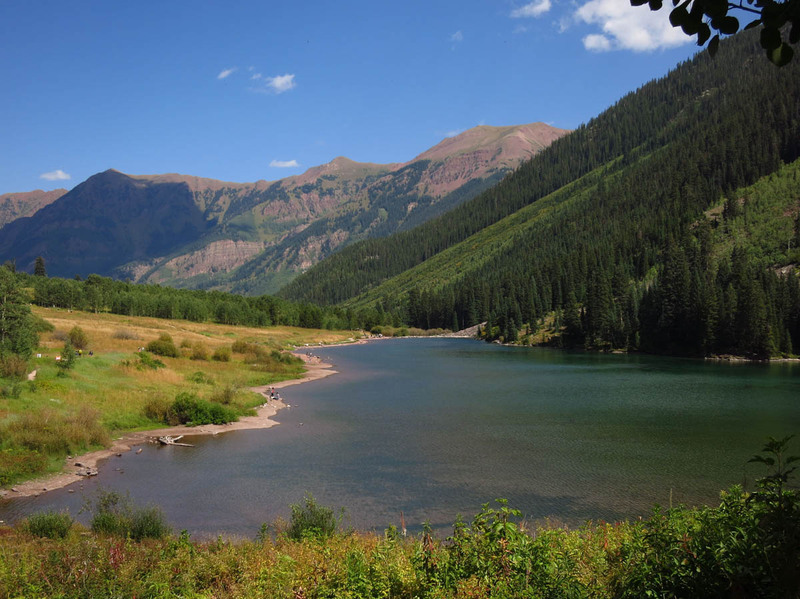 I just love seeing and reading your coverage of all this beautiful Colorado country!!! 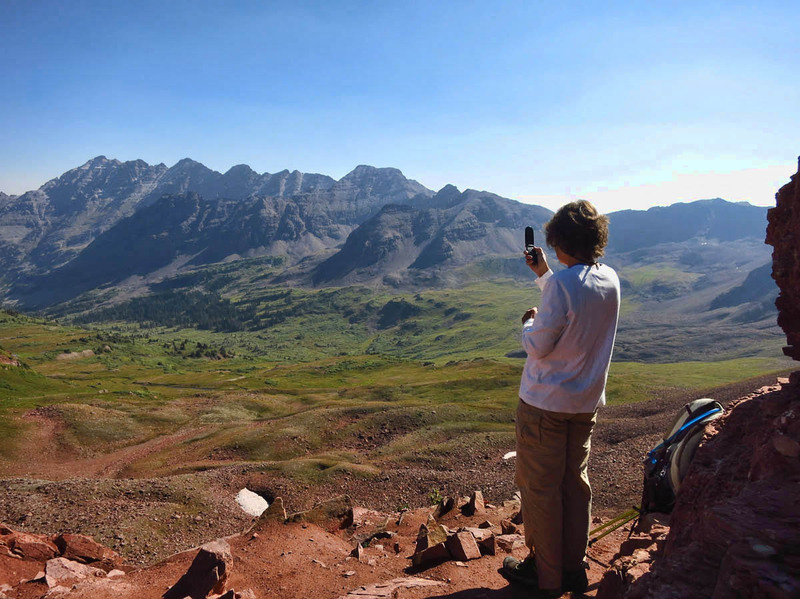 You must be as crazy as Mark and Bobbie hiking at these high elevations. Thank you, because I’m not likely too and love to see these sights.